Looking for ways of teaching creative thinking techniques for kids? 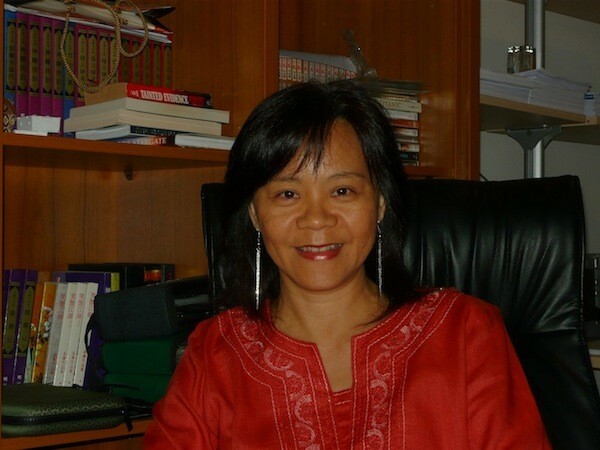 Read my interview with Megan Wong for tips and ideas. I am a mother of three children, owns and manages a daycare center for children ranging from 3 to 12 years old. I became interested in children education when like all loving mothers, I wished to learn how to teach my own children on how to utilize the marvel of their brains to distinguish them as individuals having their own unique gifts and talents and training them how to use their whole brain to think like a genius. I researched extensively on well-known brain stimulation programs like Shichida Method, Kumon, BrainGym, Tony Buzan, Edward de Bono and Howard Gardner, Jean Piaget (just to name a few). I discover one very important element in all of these methods Ð all of them are FUN. All of them provide activities and games which are fun, making children enjoy, feel happy and love to learn. They ensure their whole brain is stimulated and thinking skills are inculcated in their learning process. I have been training children for the past 10 years on how to practice smart thinking and learning through our English, Mathematics, Art and Memory Techniques programs and have witness children whom I have nurtured grown into individuals who are able to discover their own gifts and talents and knowing how to think and learn creatively and how to have fun while learning. I have also created a program called LingoFun which uses flash cards to develop language, creativity and memory skills and I incorporate music, dramatic play, story-telling and art activities into the games. These games reinforce what they have learnt and is a very effective learning because the children discover that learning can be fun and it is a known fact that they learn best when there is fun and laughter. What are the Thinking Skills That a Preschooler Should Have? From my personal experience, children should acquire and develop their thinking skills but one particular thinking skill which I would always try to incorporate into my program is creative thinking skill. Creativity is the ability to think in unique ways, produce unusual ideas or combine things in different ways. Many educators, scientists and philosophers have recommended that today's children should learn to be thinkers. Children must be able to solve problems, be flexible in their thinking and be willing to venture into new areas of study that have yet to be discovered. Mozart, Einstein and Da Vinci are creative people who thought in new ways and challenged others to question traditional thinking in their fields and whose innovative ideas have literally changed the world. Why is it important to develop creative thinking? Imagine this game which I did with the children in my center. I would tell them that we are going for a nature walk in the garden to collect all types of things Ð leaves, twigs, flowers and rocks and we have to think of a design on how best to display these things. The children came up with many wonderful ideas Ð some said to glue them on a hardboard, string them up, place them in plastic bags or put them in a box or bottle. This game challenges the children to come up with as many different ideas as they can, provides an opportunity for their imagination to go wild and to have confidence in their ideas. Creativity is the ability to think in unique ways, produce unusual ideas and combine things in different ways. It lies somewhere in between a person's imagination and their own individual abilities and Mozart, Einstein and Da Vinci had discovered their own way to unlock their individual creativity and made it work for them. Howard Gardner who developed the Theory of Multiple Intelligences quoted "If in early life, children have the opportunity to discover much about their world and to do so in a comfortable, exploring wayÉ they can draw on it in later life". How Does the Mind Power Series Help Develop a Child's Imagination, Creativity and Thinking Skills? "Mind Power Series" has three e-books "English Power is Fun", "Brain Power is Fun" and "Math Power is Fun". These books helps to develop children's thinking skills. I have divided the different areas of thinking skills into this comprehensive chart and would illustrate how "Mind Power Series" can help in each area. This is best illustrated in one of the activities which is called "The Fruits Holiday" and is extracted from "English Power is Fun". I have creatively woven vocabulary skills with analyzing, comparing, observation, counting and solution finding skills in this one activity. The number-code provides a solution for the children to find the name of the fruits and the footnote trains the children to be aware that there are many possible ways to find the solution as by changing their pattern of thinking helps them to think creatively and independently and develop their own individual way of thinking and learning. Another activity in "Math Power is Fun" is called "We are numbers". This activity trains the children on counting skills. Divergent thinking is cultivated through questions 1, 2, 4 and 5 where the solutions are provided instead. These questions train the children to see the problem in a different way providing them a technique to find their own way "into" the problem. "Tangrams are Fun" is an activity extracted from "Brain Power is Fun". It trains on spatial skills - fitting things together, taking them apart and rearranging the parts to create another picture. Tangrams is a great tool to use to foster critical thinking and solution finding skills, spatial rotation skills and develop an intuitive sense of geometry. "We are not the same" extracted from "Math Power is Fun" trains visual perception by finding which animal is different. The footnote guides you on how to ask questions to help children to think for themselves, make connections between what they already know and new topics and have the confidence to explore topics using their own ideas. The Why, Where, What, How and Which questions when used regularly teaches children on how to use their curiosity, develop their thinking and use their ability to question and reason when they learn and is one of the strategy which I always use in all my program in my vision to nurture brilliant children. "Alphabet Hopscotch" is another activity extracted from "English Power is Fun". This activity not only trains on motor skills but encourages the children to imagine and create new and different ways to play this traditional game of Hopscotch. This activity also trains the children to follow directions and exposes them to "probability theory." There are many activities in "Mind Power Series" which trains children on reasoning skills and this activity "What time is it?" trains children on inference skills, establishing connections between things or events. Familiar nursery rhymes are used in this activity and the children have to find the solution to the questions by connecting what the mouse did when the clock strikes one. This activity is really fun as I did it during one of my English classes. We turned it into a play and used props like a big clock and a toy mouse. I will have three children, one child reading the rhyme, another to move the hands of the clock and the third child using the toy mouse to run up and down the clock. This activity "Three Monkeys" extracted from "Brain Power is Fun" trains reasoning skills by guiding the children to make deductions from clues given and finding relationships between the groups of fruits to find the solution. This activity also trains their solution finding skills when you guide them by using the Why, How and What questions as per the footnote. Finding relationships between things to solve problems and find solutions are useful skills in mathematics. The "4-Box Sea Creatures" is extracted from "Math Power is Fun" and guides children on how to solve visually complex problems by breaking to smaller and more manageable parts. This activity also develops navigation skills, where is left, right, top and bottom and counting skills. When I play this game in my Math classes, I would draw 4 big squares and place toys inside these squares. I would then tell one of the children to hop to the top right square and ask them what and how many toys are inside that square. I would then ask the other children open-ended questions like "Are they your favorite toys? ", "How can you play with these toys? ", "What are these toys made of? ", "What other materials do you think you can use to make these toys?" or "Where can you find these toys, in the jungle or ocean?" "Shapes" is extracted from "English Power is Fun" and develops children's fine motor skills through drawing and solution finding skills. When the children are asked to see how many squares the house has, we are training them to shift and rotate their thinking to see different relationships and connections. This is an essential tool to imagination and creativity. 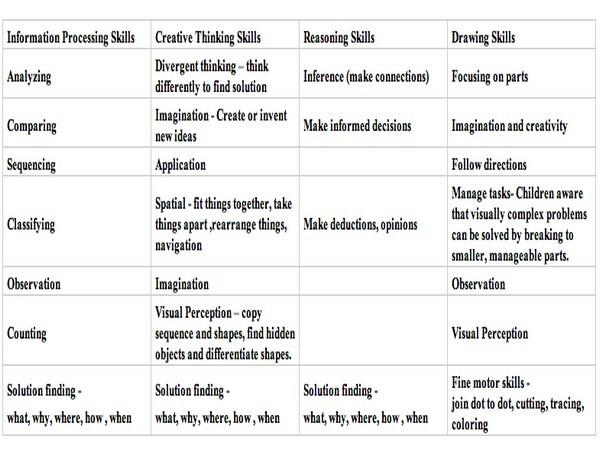 What are the Activities for Developing Thinking Skills in Kindergarten? "Brain Power is Fun" has an activity called "Color Me Out" which is a combination of two activities: solving the riddle by finding the odd item. Riddles engage children in a great deal of thinking activity. In order for the children to solve the riddle, they need to know what these items are, how to use them, what these items are for and where these items can be found. This activity also helps children to establish relationships between these different items to find the solutions. I love to play this riddle game in my classes as it expands their knowledge about things around them and their vocabulary. "What are string crafts?" is another activity from "English Power is Fun". It is a craft activity and during the class, I would tell the children the story of the gingerbread man. Children love story telling and gingerbread man is a classic which most of them are familiar with. They would get so excited when I tell them that not only can they eat the gingerbread man, it can also be used to decorate their Christmas tree or their house with the gingerbread man. This makes the children aware that they can come up with as many different ideas as they can on how to use anything, another effective and fun method to develop creativity and imagination. Why is It Important to Develop Thinking Skills in Young Children? It is important to develop children's thinking skills during the early years of their life as early years are a critical time of development and experiences during this period impart lifelong learning. Developing the children in the various areas of thinking skills as depicted in my above graph shape the mind, expand capabilities which will have profound effect on how children think and behave. Searching for the solutions of the unknown challenge, creating and inventing new ideas, having a "never give up" attitude when faced with a difficult task, and having original thoughts are established early in life and when established will continue later in life. The 21st century will see more new markets and technologies emerging and with it comes the need to nurture our children to mature into adults who are confident, who can express ideas and create knowledge, who can learn quickly, who can develop and discover their individual natural talents and creativity, who can see potential and possibilities and who ask questions rather than simply follow commands.